This week I’m honoured to be a participant on the European Union Civil Protection Mecanism Introduction course. This is a pan-Europe course being held near Split in Croatia, and I’m one of 24 experienced delegates from a wide range of different European countries. The course is fairly intense, with working days from 08:00 to 18:30 nearly every day, so I’m not going to get as much time to blog as I anticipated. Instead I’m going to capture my questions and reflections each day and then summarise the course as a whole when I’m back in the UK. Why isn’t there a better level of general awareness of the EU Civil Protection Mechanism within the UK emergency planning community? Actually, when we say Civil Protection, how does this link to identical/related fields of Resilience, Disaster Risk Reduction and Emergency Planning? How can we maintain perspective when talking about international disasters? Is the UK ‘too safe’ to have a conversation as peers on this issue? Are emergency planners in the UK typically Malthusian or Cornucopian, or somewhere in between? Does that have a bearing on the processes we develop? Should it? How does the EU Civil Protection Mechanism link to the HFA and HFA2? Is exposure the same as vulnerability in a disaster risk reduction context? How aware of wider geopolitics does the UK emergency planner need to be in 2014? Is food security the new cloud on the horizon in developed countries? A thoroughly interesting day, and I’m excited about learning more from colleagues who have worked on overseas deployments far and wide, and hopefully getting some way towards answering the questions I’ve posed myself above! I’ve got a little longer to blog today so thought I’d explain a bit more about the course. The EU Civil Protection Mechanism came into being in 2001 and is an agreement and set of supporting arrangements to enable pan-Europe coordination for Civil Protection. This includes things such as providing equipment and resources if an emergency goes beyond that which a country has capacity to deal with, but also includes information exchange and a programme of training and exercising to share ways of working with European partners. The Community Mechanism Introduction is the first of 12 courses which train participants in the skills to manage, lead and support these arrangements, which can be deployed either within or outside of the EU. Today’s lectures further explored the current and future challenges for disaster response, legal aspects of responding to disaster (which was fascinating and confusing in equal measure), and then group work using the tools of the Civil Protection Mechanism to ‘solve’ disaster scenarios and consider information management. Why is there a reluctance to consider Sphere standards in the UK (in my experience at least)? We know the Civil Contingencies Act inside out (ish!) but what other national, European and International law should be taken into account? How important is ‘being seen to act’ – do we acknowledge this? Is there a need for reference to models such as Maslow’s hierarchy of needs when trying to prioritise services? Focusing on output rather than process? Disaster: many have tried and failed to define it, why is it so difficult to land on something we all agree on? Tomorrow we’ll be investigating civil protection and crisis response structures in all of the 28 EU member countries, I’m looking forward to that as from conversations with the other colleagues there are some notable differences. Today was hump day for the Community Mechanism Introduction course today. This meant two things, firstly that the instructors are turning up the heat but secondly, that we’re beginning to function better as a team generally and specifically within our groups. 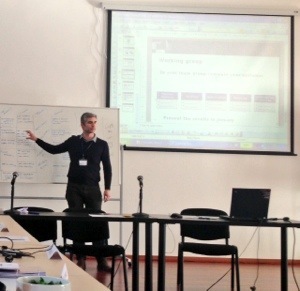 Today our main focus was gaining an understanding of the national civil protection arrangements across the EU, and whilst there were many similarities to the UK, there were some interesting differences entering around structures and financing models (the picture below if me feeding back the discussion within our team!). We also spoke today about the operational management of EU resources in the field and participated in a number of exercises to put those skills into practice. Less questions came up for me today, but here were my key observations of the day. There is a propensity for EU deployments outside of Europe to be longer duration, is this a product of need or does it also link to the politics of ‘being visible’? How do/should Humanitarian Principles (Humanity, Impartiality, Neutrality and Independence) link to domestic emergency preparedness? We’ve heard of lots of examples of where EU countries have provided support internationally, but very few of these have been from the UK. Is that just down to the selection of examples or do we not ‘give’ as much? Why doesn’t the UK make use of protected symbols for Civil Protection? Are UK Airwave radios compatible with international/EU communication systems? There we have it, some operational detailed questions, and some more fundamental ones to reflect on…expect a few more tomorrow! The penultimate day of the course means that today mostly centred around putting into practice some of the issues we’ve spent the week studying. The scenario for our day long exercise was that our team was the first EU Civil Protection resources to arrive in Ukraine after some intense flooding. Our challenge – to liaise with the Ukraine government and the EU Commission; and coordinate the arrival and deployment of specialist European resources. I’ve participated in a LOT of tabletop exercises, but what surprised me most about this one was that it was so well organised. Essentially the instructors were running the same exercise simultaneously four times! It was really good to get see the operational side of the response, the combination of fast-pace and long gaps in activity reminded me very much of my role during the Olympics in the London Operations Centre! No questions today, as the formal dinner of the course is in around 20 minutes, but after the recap tomorrow I’m sure there will be a few straggling questions which I’ll share, as well as my overall thoughts on the course!